This is really complicated for a small portrait. 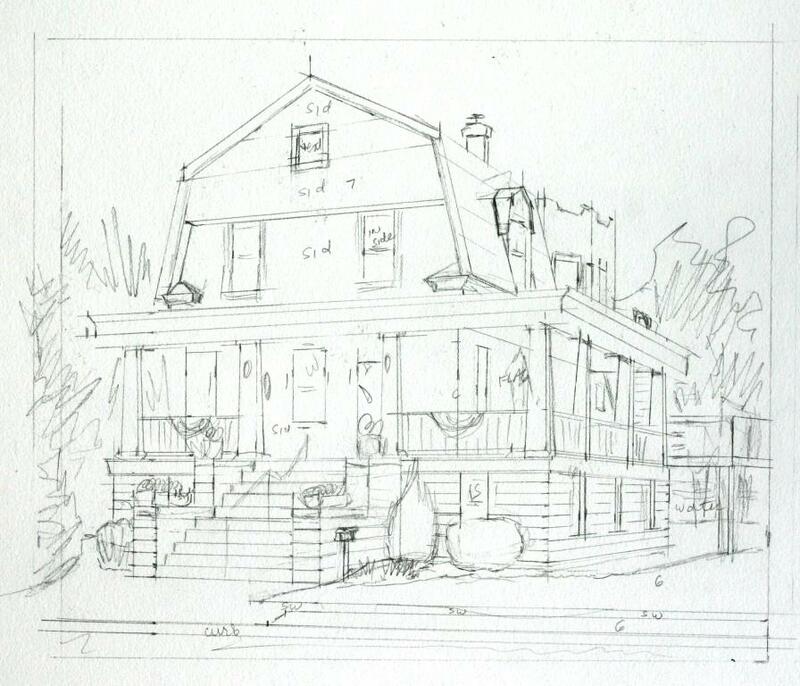 Between the gambrel roof, the raised covered porch, and the windows, there is one heck of a lot of layout for a 8×6 drawing. And that is not even counting the turret and deck off of the back. It took the time of a much larger drawing to complete. I increased the height some to accommodate the three stories, too. I didn’t want to reduce the aspect of the house to fit the 6″ dimension and merely add more to the side yard areas. The complexity of this house means it needs all of the space it can get. It is an interesting home though. I would never have guessed that it has a seaside view of the Atlantic Ocean. The landscaping is rather minimal, but there are large flower pots on the stairs and patriotic bunting on the railings. There will be a flag hanging off of the right porch post pillar, too. A small mailbox is situated in the beds on the right side of the porch. All of these little details will help personalize the house and make it welcoming.